"The Springs" section is the eastern end of the V&E Greenline. It is a quiet, tranquil area with large trees that provide shade and beauty. 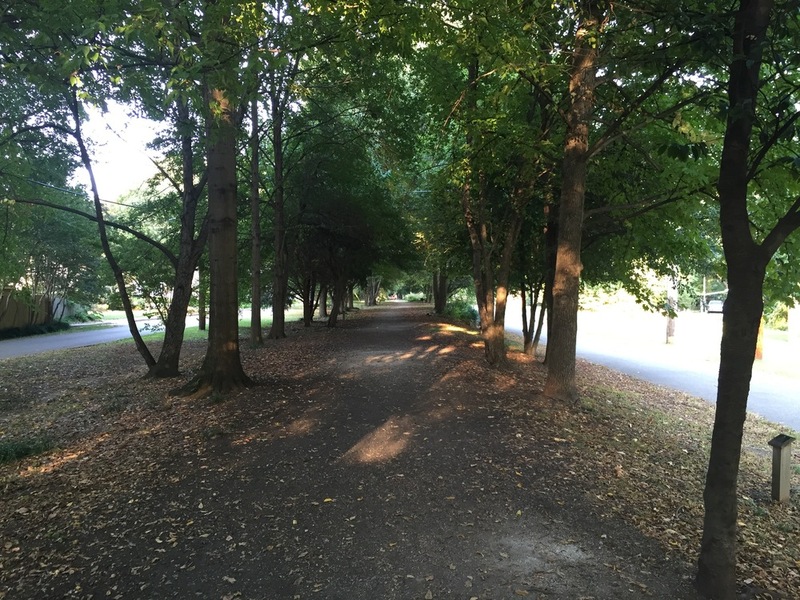 It is also the widest section of the Greenline and has many varieties of trees, shrubs, and vines. In historic times, it had an active spring, and was also near a baseball diamond and dance pavilion. A railroad spur was temporarily created to deliver materials to construct the first Rhodes College buildings. "The Cut" section from McLean Blvd to University St has high earth walls and is surrounded by a beautiful tree canopy. Because of concerns about erosion, the previous railroad owners planted kudzu, an invasive vine. Volunteers have mostly tamed the kudzu and helped save the trees that were formerly being strangled. The entrances have notched posts called bollards, which are found throughout the V&E Greenline to prevent motorized vehicles for entering the trail. "The Arbors and Gardens" section between Auburndale St and McLean Blvd contains 15 species of trees that are labeled for an arboretum designation. Adjacent residents were visionaries who moved many trees from their back yard to the V&E Greenline and watered them by hand the first few years. Many of the trees in the Arbors were planted in 1995, and the canopied forest is now home to birds as well as a resting place for users of the Greenline who want to enjoy sitting under the trees. Residents also started the garden on a small plot. Gardening was difficult because there was no soil—only railroad gravel and ballast.The gardens at Idlewild are a product of volunteer efforts and now have 30 species of perennial flowers. The "Lick Creek" section meanders from Dickinson St to Tutwiler Ave, crossing the creek on a bridge built by Keeler Ironworks. The creek, a natural and living ecosystem, has a variety of wildlife and has been a long-time attraction for children. After heavy rains, the bridge provides access over an impressive, raging torrent, moving water from the Overton Park area to the Mississippi River which is 6.6 miles by a water route. The "Stationhouse" section runs from Avalon St to Belvedere St and has open green spaces that contain the water pumps from the golden sands aquifer, through which MLGW provides water to Shelby County residents and businesses. Mature oak trees provide a canopy for shade and a perfect venue for outdoor activities. 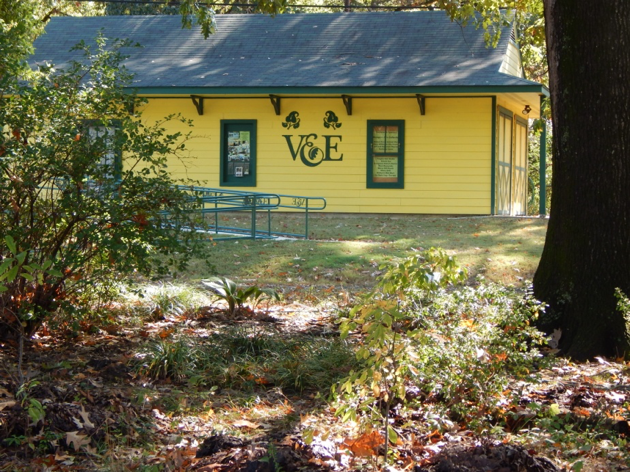 This area takes its name from a nineteenth-century-style railroad stationhouse, located at 1625 Tutwiler, that serves as the "Trail Center" for the V&E Greenline. This area is the site of the annual V&E Artwalk and the Woodland Memory Path. Ot has a water fountain for both people and pets. The "Keeler Bridge" section from Stonewall St to Avalon St, is highlighted by a beautiful iron bridge which was constructed and donated by Keeler Ironworks. The bridge serves to unite this section of the V&E Greenline with adjacent neighborhoods. The beautiful Glenmary, a full service housing community for seniors, is located to the south of the trail. "The West End" section starts at the bridge near Watkins and North Parkway, and goes to Stonewall St. Steep bluffs. 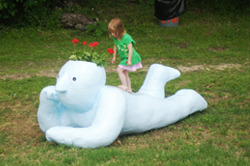 The bluff's panorama of trees and greenery provide a natural site for the “Big Kids” sculptures, designed and built by a Rhodes College art class. To the west is the Crosstown Concourse building, envisioned as a vertical urban village which will include health care, housing, and the arts.One of the adjacent residents said that looking out her back yard reminds her of the Smoky Mountains where she camped.